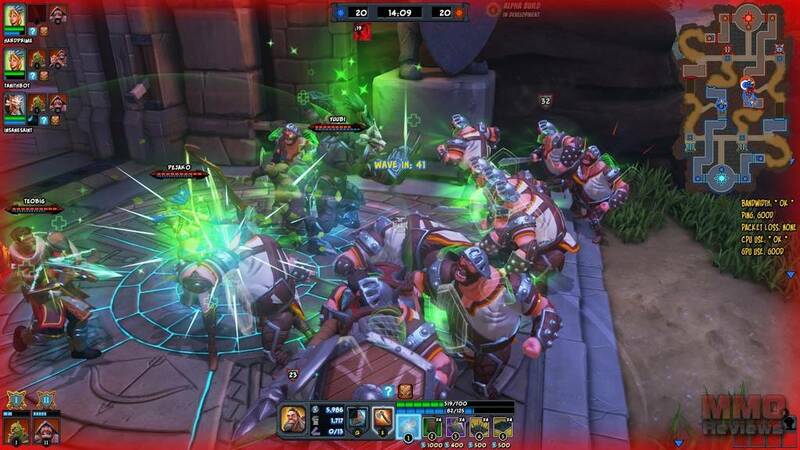 Orcs Most Die: Unchained is a new adrenaline charged PVP action MOBA where players are tasked with assaulting an opposing teams’ fortress with their friends, Guild members and allies whilst at the same time protecting their own base from enemy invaders. The game is a free to play title available on PC that is a mix of MOBA, tower defence and card collecting game is, creating an intriguing and exciting action genre. The game puts two teams up against each other, made up of AI bots or real players to take on the role of heroes in the battle with two purposes. Firstly players must try to break down the opposing teams defences, consisting of traps, doors, extremely strong AI guardians, endless waves of minions and other players in an attempt to get 20 of their own minions into a portal at the other end of the map in the enemies base. Secondly they must stop the opposing team from trying to do exactly the same thing. To be successful in the fight players must master the art of being both a defender and an attacker to be victorious. Players are able to further customise their own heroes using a wide selection of cards that they can unlock or purchase that enables them to equip their hero with a variety of traps, minions and items that they can use during a battle. Cards go into a player’s pool and they can build individual decks/loadouts choosing which cards they wish to use for a particular battle.